Janmashtami is just around the corner and there will be numerous celebrations all over KZN. The July/August 2013 Hare Krishna News highlights all these events. You can download/view the latest edition at www.iskcondurban.net. Srila Prabhupada first published Back to Godhead (BTG) magazine in the 1950s and he referred to it as the backbone of ISKCON. We are the leading distributors of BTG outside of India. Today people have even less time for spiritual enquiry. BTG offers seekers light reading on spiritual subjects. With this in mind, we decided to make BTG more widely known and read and are hosting a marathon to increase the number of readers/subscribers to BTG. There are fantastic incentives to join the marathon and you can learn more about BTG and the marathon on Sunday during the Love Feast. 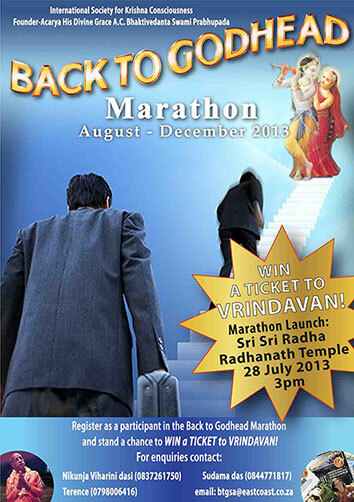 Sri Sri Radha Radhanath Temple Love Feast Special BTG Marathon Launch at 3pm. See poster for details.